We don’t call this the Ultimate Lanyard for nothing. GeoKnots took all the things that geocachers need in a lanyard, and made it even better. You won’t have to trust your expensive GPS, smart phones, cameras, and other electronic gear to a flimsy strap any longer. 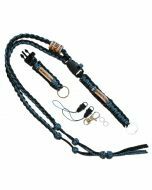 Each Ultimate Lanyard is proudly made by geocachers, for geocachers from super-strong U.S.-made survival paracord. Plus - it's trackable! 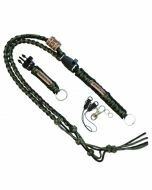 Fully adjustable length to comfortably fit any geocacher. Two interchangeable, quick-disconnect attachment ends for your GPS or other equipment (3″ long and 6″ long) for additional flexibility. Safety breakaway feature with sliding hand-tied ranger knots. Built-in emergency whistle on each quick-disconnect attachment. Hardware attachment pack for your electronics — a sturdy metal snap hook, two mini quick-disconnect cables, and two mini split rings.